The Intermec CV41 delivers the freedom and flexibility to work the way you want. It is perfectly-sized for forklift applications, reducing visual obstruction and simplifying installation compared to full screen devices. It is easy to standardize across your forklift fleet and resilient enough to handle tough distribution center environments. 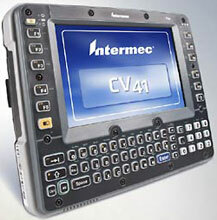 In addition, the Intermec CV41 offers the accuracy, productivity, and safety of hands-free voice directed work. In fact, it is the only Windows CE vehicle-mount computer on the market with Vocollect VoiceCatalyst. CV41 USB Y-cable - D9 MALE TO USB TYPE (A) 6 ft.